The makers of Fantasia Hookah Tobacco have released their own brand of Coconut Hookah Charcoals! 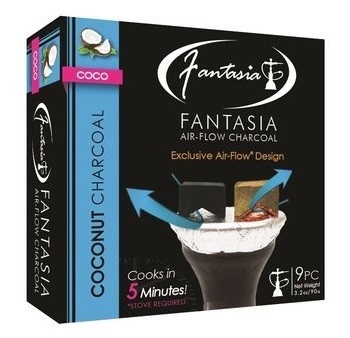 Fantasia Air-Flow Coconut Hookah Charcoals are a patent-pending innovative Hookah Coal that are lit in the same way as other Coconut Hookah Charcoals (with an Electric Stove Top, Grill, or Single Coil Burner). Once the coal is glowing red with no black showing, they're ready to be placed on your Hookah Bowl. 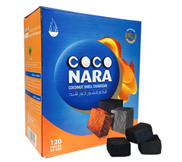 What sets these coals apart from the other coconut hookah coals are they're not meant to be ashed off or rotated on the Hookah Bowl. The upside-down "V design elevates the heat and allows for oxygen to flow through the coal, keeping it stoked throughout your smoke. Even while ash accumulates around the coal, it does not need to be removed as it does not hinder its performance. Each box contains 9 pieces and each coal will last approximately 45 minutes each. It is recommended that you heat the charcoal on an electric stove or open flame before every smoke.